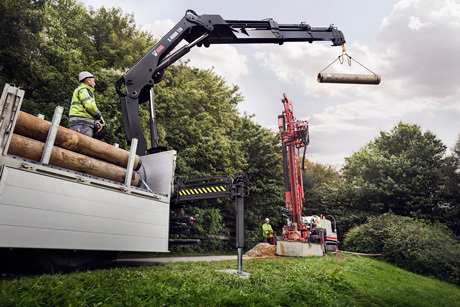 Hiab, part of Cargotec, has received an order for five HIAB X-HiDuo 158 cranes from the French customer Noblet Cotra specialised in public work and construction. The order was preliminarily confirmed in connection to the IAA exhibition in Hannover, Germany and it has been booked into Cargotec's 2016 fourth quarter order intake. The renewed HIAB X-HiDuo 158 loader crane with lifting capacity up to 15tm offers a remote control system that allows several actions to be carried out simultaneously, and it has a built-in intelligence system for safe and effective load handling. The cranes are painted according to the high-tech nDurance(TM) painting process to safeguard a long life and a good looking crane over time. "Based on our long relationship with Hiab, we are confident that the quality of these new loader cranes meets our demands. For us it is important that the wishes of our installation workshop are listened to and with Hiab we have had a very good experience in this," says Mr. Laurent Galle, CEO, Noblet Cotra. "We are very happy to receive this order from Noblet Cotra. These HIAB X-HiDuo 158 cranes will ensure great performance and fast load cycles, easing our customer's work. We continue to work closely with Noblet Cotra to come up with the best solutions for their needs," says Mr. Philippe Auger, Direct Sales Business Manager, Hiab. The new HIAB loader cranes will be installed on compressed natural gas engine trucks and will be delivered during the first quarter of 2017. The cranes will have an extended warranty that covers all HIAB loader crane models delivered as of 1 October 2016. Hiab offers its loader cranes customers a five-year warranty on structural components as well as a general warranty of two years.